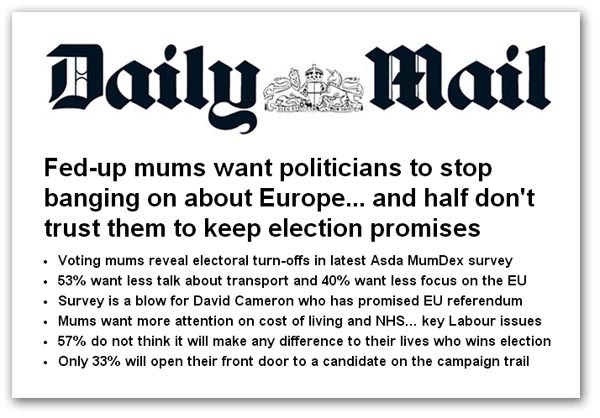 Useful, if limited, political insight comes with yesterday's Mail which records the results of a "MumDex" survey based on the questioning of 3,000 Asda customers. Forty percent of those, we are told, want politicians to "stop banging on about Europe" and focus instead on easing the pressure on family finances. Specifically, they (meaning 75 percent) want politicians to focus on the cost of living. Next in line was the NHS, which 70 percent named as a concern, while immigration scored only 53 percent, despite being top of the concerns in the recent YouGov survey. The NHS finding is interesting, although one might expect women to be more concerned with health issues, as they tend to be the primary carers for children and relatives. And this may be good news for Mr Cameron, with a ComRes poll recording that 22 percent trust the Conservative party leader to manage the NHS, compared with 20 percent trusting Ed Miliband. Back with "MumDex", more than half – 53 per cent – want politicians to talk less about transport and, surprisingly, 24 percent want less focus on childcare, perhaps a reflection of the way it has become pigeon-holed as a "female issue", when women have much broader concerns. Nevertheless, the news is not so good for politicians in general, as 44 percent say it will make little or no difference to their lives whoever wins the election, while 59 percent do not trust whoever is elected to implement the policies they campaign on. Yet there is an element of contradiction here, as only a third of those responding are willing to open the door to a candidate during the coming election campaign. They would rather read analyses of a candidate's comments in the papers than actually hear from the candidate directly, with two-thirds getting most of their information online, from the TV and from newspapers. Quite where this puts us, as always, is difficult to ascertain. It makes an interesting contrast, though, with a separate Populus report which has about 44 percent of 18 to 25-year-olds yet to decide which party to back on 7 May. The research found more than three quarters (77 percent) intended to vote - but only 30 percent of young women said they were interested compared with 48 percent of their male peers. Asked of their concerns, 69 percent went for cost of living, 62 percent cited affordable housing, 58 percent unemployment and the same proportion said the NHS. Exactly half put online privacy among their main concerns - more than the environment (45 percent). Immigration only scored 43 percent, tax avoidance was cited by 37 percent and Britain's future in the EU only got 34 percent. As to the 77 percent claiming that they intended to vote, this is not credible. Other studies have indicated that young people are least likely to turn out and vote, with estimates as low as 39 percent of registered 18 – 24 year-olds voting, compared to 70 percent of those aged 65 and over. And then, the registration levels of the younger group are also lower. This does make you wonder about the rest of the survey results, but we read them for what clues they give us, for good or ill. But is probably true to say that, whatever the opinions of the different groups, the "wrinkly" opinion is worth twice as much, because they are the ones that go out and vote. And it is probably turnout, more than anything, that is going to decide the next election - although I would not discount the Miliband effect. Whatever the polls say, he does not come over as a credible prime minister. That may be the factor on which the election finally depends.